future conflict will be increasingly hybrid in character. state failure will be one of the dominant, defining features of future conflict. the access to resources (energy, food or water) will drive states’ security interests; control over these resources and their methods of distribution through the global commons will be a critical feature of conflict in the international system. It may dictate why we fight, where we fight and thus how we fight (how many times on this blog have I raised the issue of skirmishes over food and water in the future?). al-Qaeda and other extremists are likely to hang around and pose a threat. climate change may create instability, especially in those states that are already vulnerable to other pressures. the world’s population is rising and this will lead to increased demands for resources. smarter adversaries have adapted to counteract the Western preferred way of warfare. the risk of Chemical, Biological, Radiological and Nuclear (CBRN) use will endure; indeed increase, over the long term. if the character of the last military era was defined by the West’s ability to conduct precision strikes on enemy platforms and command nodes, the conflicts of the future are likely to be defined more by the centrality of influence eg influencing public perceptions. So the future will be a battle of narratives within a decentralised, networked and free-market of ideas. in future conflict, smart adversaries will present us with hybrid threats (combining conventional, irregular and high-end asymmetric threats) in the same time and space. in some conflicts, we are likely to see concurrent inter-communal violence, terrorism, insurgency, pervasive criminality and widespread disorder. “The merging of state proxies, extremist ideologies and criminal interests into a toxic cocktail, along with the effects of globalisation, such as more porous borders, will make some non-state actors harder to counteract. They could employ a wide spectrum of military capabilities, albeit some at a limited scale, but they will nevertheless be capable of innovative tactics that exploit inherent UK vulnerabilities“. Obviously, this report will lead to a huge debate over Britain’s defence forces and it was interesting to read in the report how social networking sites will become an important feature of future conflict (p.18). You can download the report here. Entry filed under: Future predictions, Future trends, Useful resources. 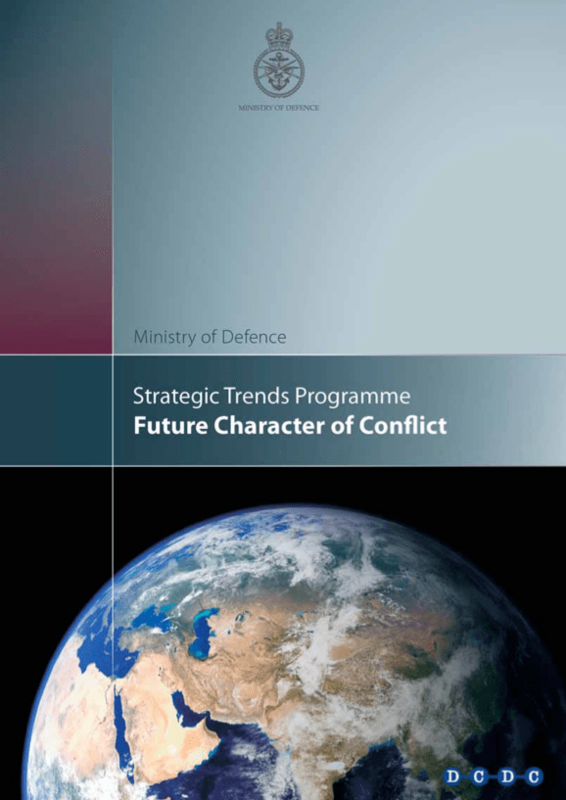 Tags: Britain, Concepts and Doctrine Centre, DCDC, Development, Future Character of Conflict report, UK Ministry of Defence, United Kingdom, warfare and social networks.